How do we make sense of uniqueness? How can we use uniqueness? And how do we make appropriate decisions when some or all of a context is inherently unique? In the first post in this series, we skimmed through Max Boisot’s I-Space and its impact on sensemaking in relation to complex-adaptive-systems. I then added a bit about my personal background, and why my own work focusses much more strongly on the individual context, the individual and personal moment of action, and its expression as personal knowledge and personal skill. Finally, we saw a quick overview of why uniqueness or ‘particularity’ is important in enterprise-architectures. In the second post in the series, we had a brief exploration of why Boisot’s I-Space and similar frameworks don’t fit well with the sensemaking-needs for unique contexts – and illustrated this point with the real-life example of Flight 1549, the so-called ‘Miracle on the Hudson’. In this post, I want to explore the different types of sensemaking that need to happen at ‘business-speed’ – especially when we have to cope with uniqueness as well at that speed. In the final post in this series, which will follow this one, I’ll summarise some of the issues around how to balance the sensemaking techniques at ‘business-speed’, and the architectures that we need to support such forms of sensemaking. So: ideas, intention, creativity, ‘life-changing’, even – all at ‘business-speed’. Let’s get down to it? In an earlier post I contrasted a ‘considered’ approach to sensemaking, versus ‘business-speed’. A ‘considered’ approach assumes that there is available time in which to make sense of the context. 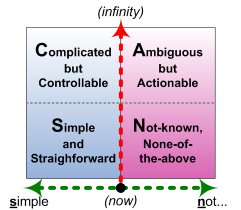 Formal ‘hard-systems thinking’, for example, tends to focus on analysis, whereas a ‘soft-systems‘ or ‘complex-systems‘ framework such as Cynefin tends to focus on experimentation and emergence. All of these methods rely on an iterative cycle of information-gathering and review – ‘sense / analyse / respond’ or ‘probe / sense / respond’, in Cynefin terms – that takes a significant amount of time to execute each iteration. There are ways to speed up the analysis/experimentation cycle, but in practice there is probably no way to make it work at business-speed, at or close to the real-time ‘now!‘. A ‘business-speed’ approach assumes that there is little or no time in which to assess, analyse or experiment in the context, yet sensemaking and intentional decision-making must still take place. Whilst the ‘considered’ frameworks do make various recommendations here, in my experience they’re mostly aimed at gathering information to bring back for analysis or experiment – which actually doesn’t help that much when we’re in the real-time context. For the latter, we need something different. Again, it is a spectrum, and in real-time contexts we typically move back-and-forth across that spectrum, often at very high speed. For simplicity, though, we’ll split this exploration into those two parts: Simple, and Not-so-simple. Machines work on rules. Most IT-systems work on rules. Work-instructions are rules, of a kind. As mentioned in the previous post, checklists provide very important rule-like support for real-time action. Yet rules themselves are not the whole story, because the capability to apply those rules also has to come from somewhere – which likewise is not always as simple as it seems. [I’m playing in an Irish-music session at the local pub: I’ll freely admit I’m no master-musician, so I’m keeping well in the background here, yet still keeping pace with everyone else. It’s a very fast reel we’re playing, probably upwards of 150 beats per minute: that’s more than 10 distinct notes a second, or an average of perhaps 20-40 finger-moves a second, often not in linear sequence. The tune ends, another starts, still exactly on the beat; just about everyone switches straight away to this new tune, within a note or two at most – though no-one had rehearsed any of this beforehand, or even knew which tune would come up next. What’s going on in this body-learning is that patterns and sequences are embedded through constant repetition – in theory, itself a Simple process. Quite where these patterns are executed in physiological terms I’ll admit I don’t know, but the speed suggests it’s run via local ganglia – there certainly isn’t time to run solely from the brain. The overall instructions to run each pattern may come from the centre – but not every move. Training usually takes place in a ‘safe-fail’ context such as a simulator, where no-one gets hurt if – or more likely when – things don’t work out as intended. With more experience, the pressure gets ramped up, and then ramped up again – but as far practicable it still remains a ‘safe-fail’ environment. The first rule in this space – and it does indeed have its own bizarre rules – is the same as that etched in large friendly letters on the cover of The Hitchhiker’s Guide To The Galaxy: DON’T PANIC! In another case, medical schools at Yale and Harvard have begun taking students into art museums to increase their observation skills, Pink said. The logic is that in today’s world, a huge amount of medical information is already available online. But learning to observe a patient is something that can’t be memorized from a checklist. Other keys here arise from the practices of intentional improvisation, such as described in Keith Johnstone‘s classic Impro, and by more recent business-oriented practitioners such as Mike Bonifer (Gamechangers) and Michelle James (Creative Emergence). For example, two key techniques that have direct business-applications are ‘yes-and‘ and Mask-work. In ‘yes-and’, we take whatever is given to us – however crazy it might seem at first – and add to it whatever comes up in the spur of the moment. This works well in improv-comedy, of course, but there are plenty of business-contexts where much the same principles will apply: front-line sales, for example. The shoe-retailer Zappos is one example of a highly-successful organisation that has literally built its business by throwing away the script for the call-centre, and instead responding to and with the customer’s needs. The improviser has to be like a man walking backwards. He sees where he has been, but he pays no attention to the future. His story can take him anywhere, but his must still ‘balance’ it, and give it shape, by remembering incidents that have been shelved and reincorporating them. Very often an audience will applaud when earlier material is brought back into the story. The couldn’t tell you why they applaud, but the reincorporation does bring then pleasure. Business-folk too will often applaud when a story seems to ‘make sense’ in this way – perhaps because it’s made to seem Simple again, although each of the individual threads that make up that story may have little or no real connection with each other, than those that we chose to perceive at the time.. The concept of the Mask is somewhat stranger. An actor puts on a Mask, and in effect enters into negotiation with it. The Mask seemingly has its own choices: different actors who wear it will often find themselves doing much the same thing, though what it does can rarely be predicted solely from its appearance. Even more strange is that whilst wearing a Mask, a performer will be in a kind of semi-trance, working with the Mask rather than attempting to ‘control’ it – in fact the whole process breaks down if there is too much of an attempt to ‘control’. All of which no doubt sounds a bit abstract, except for one key point. Although improv-theatre Mask-performances will typically use a half-face mask, with the eyes covered but the mouth exposed ‘to speak with one’s own voice’, in fact anything can be a Mask: and that includes a business-uniform, a professional ‘prop’ such as a consultant’s clipboard or doctor’s stethoscope, or even a business-location. Strange as it is, Mask-work has a number of practical applications in business: for example, almost every profession has its ‘props’ that help establish credibility with clients and others. These processes can also help to get past inhibitions and blocks such as “I’m not creative, I’m not able to work out a new way to do this process”, and so on. Strange, then, but well worth exploring further. Finally, for here, we can also seed the Chaos, bringing a chosen idea or image into the space as a focus-point for sensemaking and decision-making. This is why vision and values are so important – especially in organisations which, by the nature of the work, must deal with a high level of uncertainty and unpredictability – because they act as a ‘guiding star’ against which the images arising in the turmoil can be contrasted and compared. One of the most difficult parts of this is “trust the process”. Quite often, the ‘guiding star’ will seem to be leading us the ‘wrong way’: it’s essential at this point to trust the ‘star’ rather than our own assumptions, which would drag us back to the over-Simple and its – for here – inappropriate notions of ‘control’. The analogy here is a city with many one-way streets: often the only way to get to somewhere will involve going in what at times will be ‘the wrong direction’, but is actually the quickest way to go. Ironically, the Hudson River was in the sights of the two pilots right from the very beginning of the flight. “Yeah,” First Officer Jeffrey Skiles said. There are many other tactics, techniques and processes designed to tackle sensemaking and decision-making ‘on the edge of chaos’, of course, but these should at least give some idea of what needs to happen at business-speed on the ‘Not-so-simple’ side – and also how different most of them are from the overly-simplistic ‘act / sense / respond’ expected in the ‘considered’ approaches to business-sensemaking. As in those two Tweets with which we started here, when we’re faced with the unknown at business-speed, intention is the one thing that makes the key difference between a collapse into chaos, and a path to creating something new; and sometimes all we need is just that one more good idea. That’s it for here. In the final part of this series we’ll explore how to keep all of these in balance as we move back-and-forth across that spectrum between Simple and Not-so-simple. And we’ll also explore the architectures that we need in order to support this type of sensemaking and decision-making at business-speed. Over to you, anyway – any comments so far, anyone?